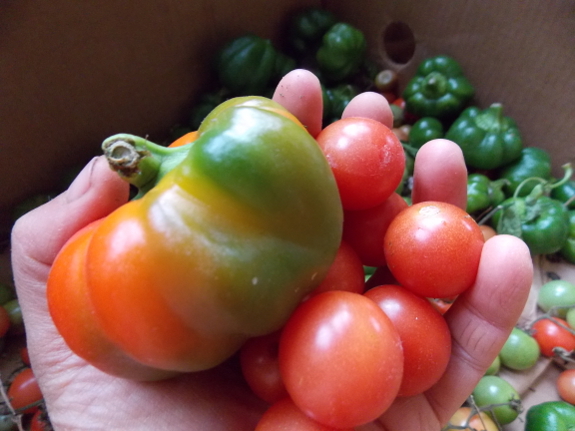 Every year, I say I'm not going to pick the green peppers and tomatoes before the frost and ripen them inside over the next few weeks. And every year I do it anyway --- it's just too hard to let summer go. I call my this my salad box since the fruits will go on top of lettuce out of the garden. The first few fruits to ripen after being take in were as good as the ones picked off the vine, but I'm already starting to sense a decline in flavor. Pretty soon, the ripening tomatoes and peppers will taste like store-bought, at which point they'll go to the chickens. Still, I guess it's worth getting an extra couple of weeks of salad toppings, if only for moral support (and prettiness). I do the same thing. The last of the tomatoes are just turning pink on my kitchen counter.